How to Optimize Your Network Performance with LC Assemblies? High-density and compact data center cabling has become the consequent trend as the rapid development of fiber optic communication. Under this trend, LC assemblies, like the LC connector, LC adapter and LC attenuator, are more and more popular in the applications of cable television (CATV), fiber-to-the-home (FTTH) and dense wave division multiplexing (DWDM) Markets. Today this post intends to explore how to optimize network performance with LC assemblies. It’s familiar to us that fiber optic adapters are used to connect fiber optic components with the same or different interfaces. Due to their ability to interconnect two connectors, they are widely applied in optical management systems. And nowadays there are various LC adapters available in the market for both single mode and multimode applications. Take the quad LC adapter for example, Quad LC adapters, designed for high-density applications, provide 4-position LC adapter solution in a traditional duplex SC footprint. The mating sleeve can connect four duplex or eight simplex LC fiber optic cables, saving more space and bring more flexibility. As we all know, signal strength needs to be reduced in some case. For instance, if a transmitter delivers too much light power, at the receiver end the power must be reduced by using fiber optic attenuator. Or it may degrade the bit error ratio (BER). LC attenuator is a type of widely applied fiber optic attenuator. It is designed to provide horizontal spectral attenuation over the full spectrum vary from 1260nm to 1620nm in single mode transmission. Therefore the LC attenuators can expand the capacity of optical networks by using the E-band (1400-nm window) for optical transmission. 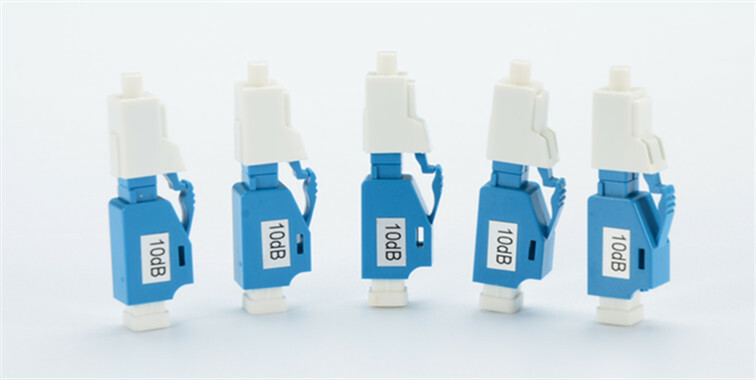 Designed with flexible “push-pull tab” uniboot connector, bend insensitive fiber and ultra-low insertion loss, LC HD plus+ fiber cables are the best choice for high-speed, high-bandwidth 1GbE and 10GbE networks in data centers. People with working experiences in data centers may know it’s not an easy task to add or remove one connector in numerous network cables. But with the push-pull tab uniboot connector, this problem can be solved perfectly. Firstly, the LC uniboot connector encloses two fibers firmly in a single cable, saving cable management space greatly. Secondly, the push-pull design enables connectors to be extracted or inserted into the port freely, which simplify the connectivity problems of limited access to the connector. 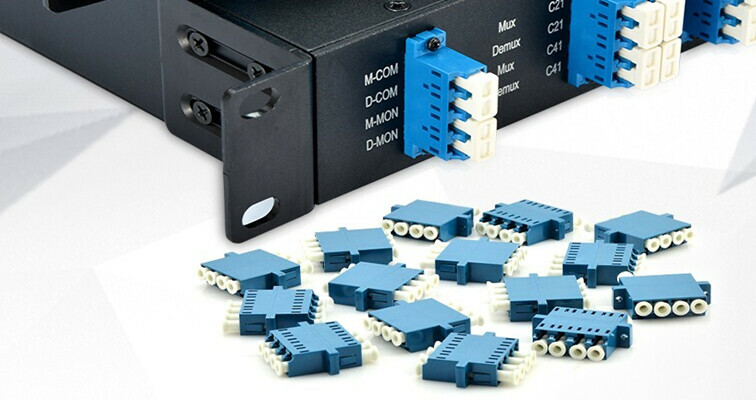 CWDM and DWDM Mux/Demux play an important role in combining data rate of different wavelengths over the same fiber cable to increase network capacity. No matter CWDM or DWDM Mux/Demux, there are several types of ports on them to ensure the normal function: channel port and line port. Of course, some Mux/Demux also have an expansion port and monitor port. A LC Mux/Demux means the LC Mux/Demux has LC connector for interfacing. It’s known to us that LC design is popular in fiber optic links. Mux/Demux with LC interface is easy to install and add WDM capacity to an existing network. The following picture shows how to use two CWDM Mux/Demux at the same time to increase the wavelengths and expand the network capacity. The 8 CH and 4CH CWDM Mux/Demux are connected using the expansion port (LC interface). LC interface is the result of increased demands for smaller easier-to-use fiber connectivity. 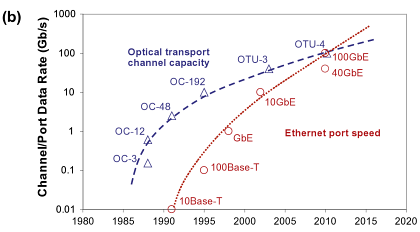 And a wide range of optical components with LC interface are widely used in optical networks. This article just introduces parts of them. Some other LC assembles such as optical transceivers, LC pigtails and LC adapter panels are available in Fiberstore. If you want to know more details, please visit FS.COM. 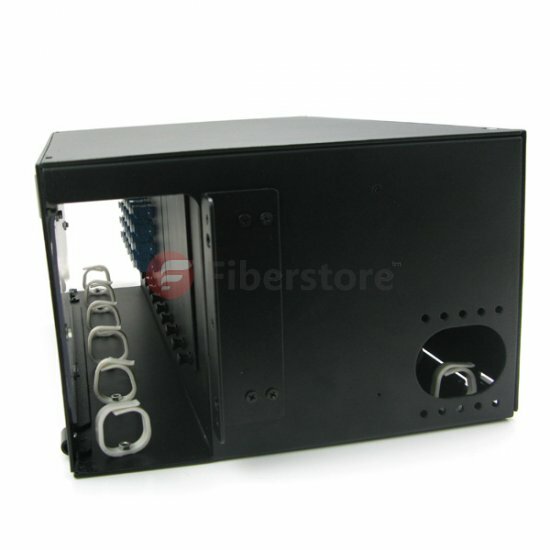 The Fiberstore company can offer customized empty 4RU rack chassis to hold 12 pieces of standard size LGX cassettes now. They can also provide the custom LGX cassettes to complete this entire solution for space saving and high-density applications. Here are some finished products for example. The specifications are described in the figure below. This is just an iceberg of custom cases that Fiberstore provides. They could make it beyond what you can imagine! Contact Fiberstore sales now at sales@fiberstore.com and tell them what you want! They’ll find the info you’re looking for and respond to your inquiry within one business day. Fiberstore is now the largest company who can supply all kinds of solutions for WDM optical networking systems, including CWDM, DWDM, MUX & DEMUX, OADM, etc.. The 4RU rack chassis is only a little part of their products. You can find whatever you want by just visiting the website (fiberstore.com). DWDM Mux and DWDM Demux are designed to multiplex DWDM channels into one or two fibers. 100GHz DWDM Mux Demux is used to provide 100GHz transport solution for DWDM networking system. The common configuration is 4, 8, 16 and 32 channels, and we also have 40 and 96 channels. 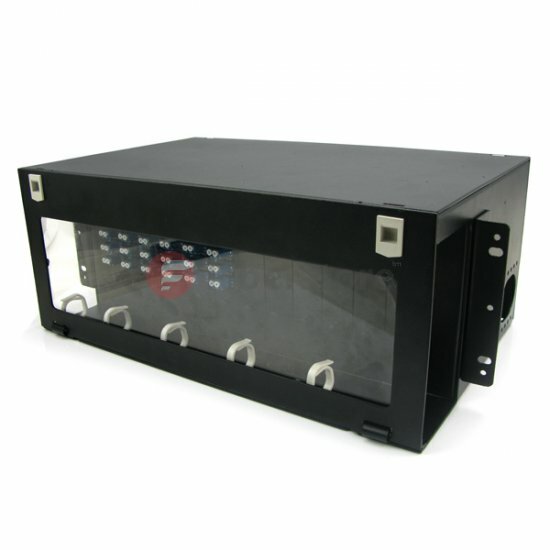 They are available in plug-in module and standalone 19″ 1RU or 2RU rack mount. These DWDM modules passively multiplex the optical signal outputs from 8 or more electronic devices, send them over a single optical fiber and then de-multiplex the signals into separate, distinct signals for input into electronic devices at the other end of the fiber optic link. We provide option of DWDM expansion port, monitor ports, 1310nm wideband port for existing 1310nm equipment. FS.COM Thermal Arrayed Waveguide Grating (TAWG) DWDM modules are part of a series of high performance products based on silica-on-silicon planar technology. Our TAWG DWDM modules are designed for use within the C-band release of DWDM system. To decrease the power dissipation of the devices in different environmental conditions, the AWG package is special designed with selection of reliable thermal plastic with low thermal conduction, and the AWG operating temperature is controlled by using foil resist heater or Peltier TEC with thermistor temperature sensor. We supply common configuration 8, 16, 40 and 96 channels which is available in plug-in module and standalone 19″ 1RU/2RU rack mount. FS.COM provide option of DWDM expansion port, monitor ports, and 1310nm wideband port for existing 1310nm equipment. DWDM transceivers from FS.COM are together used in a cost effective way. DWDM is a proven technology, which offers flat channel bandwidth, flexible channel configuration, low insertion loss and high isolation. Modules are available on the C bands, ITU 100GHz grid at channel spacing of 100GHz. Many technicians will add a monitor port on DWDM MUX/DEMUX for better network monitoring and management. 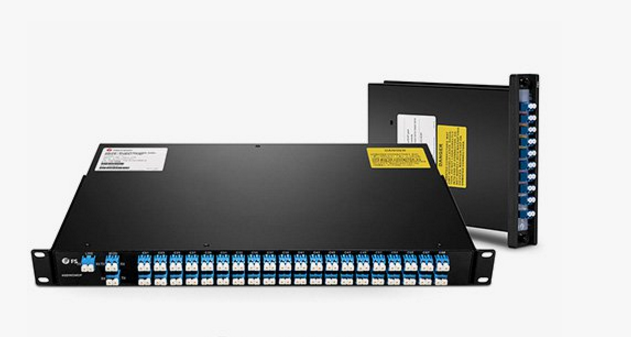 If you choose a single-fiber DWDM MUX DEMUX, the monitor port should be a simplex fiber optic port. For dual-fiber WDM MUX DEMUX, you can add a duplex monitor port for the whole network monitoring, or just add a simplex port for MUX or DEMUX monitoring. Expansion port added on DWDM MUX DEMUX is really useful. If you installed a DWDM network which just using several of the DWDM wavelengths, you can use this expansion port to increase the network capacity by connecting the expansion port with the line port of another DWDM MUX DEMUX supporting different wavelengths. Then the network of this CWDM network can be increased easily. The 1310nm port is used in some legacy networks and sometimes as a return path. If an existing legacy network is using 1310nm port and they have exhausted all fibers and are looking for ways to increase their network capacity they can add in other DWDM wavelengths on to the same fiber while still allowing the use of the 1310nm port. Meanwhile, it can carry LR optics, LX optics etc. FS.COM, as a 3rd party OEM manufacturer, we supply various 100GHz DWDM MUX DEMUX. Customer can select DWDM wavelength from ITU Grid C-Band C15 to C62. Customer can select LC/UPC, LC/APC, SC/UPC, SC/APC, FC/UPC, FC/APC, ST/UPC, ST/APC etc as connectors. 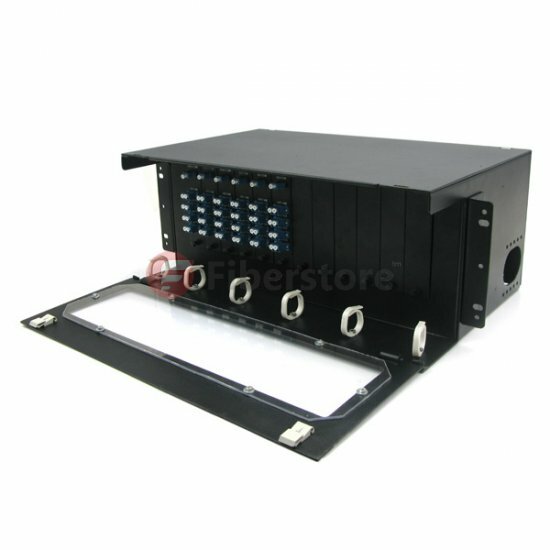 Customer can select plug-in module or 1RU rack mount chassis as housing. Customer can add monitor port, expansion port and 1310 port. As a professional optical communication products manufacturer, we also supply CWDM MUX, 100G DWDM Muxponder, and FMT DWDM Optical Transport Network System. What Is The DWDM Mux Demux Working Principle? Conversely, a demultiplexer (or demux) is a device taking a single input signal and selecting one of many data-output-lines, which is connected to the single input. A multiplexer is often used with a complementary demultiplexer on the receiving end. 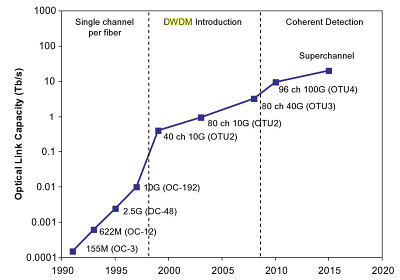 Dense wavelength-division multiplexing (DWDM) revolutionized data transmission technology by increasing the capacity signal of embedded fiber. 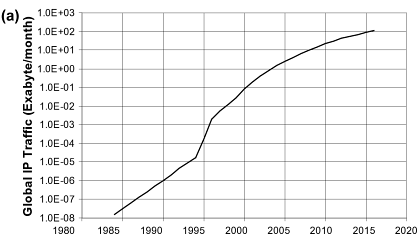 This increase means that the incoming optical signals are assigned to specific wavelengths within a designated frequency band, then multiplexed onto one fiber. This process allows for multiple video, audio, and data channels to be transmitted over one fiber while maintaining system performance and enhancing transport systems. This technology responds to the growing need for efficient and capable data transmission by working with different formats, such as SONET/SDH, while increasing bandwidth. DWDM fiber works by combining and transmitting multiple signals simultaneously at different wavelengths on the same fiber. In effect, one fiber is transformed into multiple virtual fibers. So, if you were to multiplex eight OC -48 signals into one fiber, you would increase the carrying capacity of that fiber from 2.5 Gb/s to 20 Gb/s. Currently, because of DWDM, single fibers have been able to transmit data at speeds up to 400Gb/s.As for DWDM mux/demux, the common configuration is 2CH, 4CH, 8CH, 16 CH(16-Channel DWDM Mux/Demux), 32CH, 40CH channels.They are available in the form of Plastic ABS module cassette, 19” rack mountable box or standard LGX box. And no matter what kind of connectors, like FC, ST, SC, LC etc, all are available on our website: http://www.fs.com, and we also can mix connector on one device. We can provide you with the most suitable DWDM equipment. A WDM system uses a multiplexer at the transmitter to join the signals together, and a demultiplexer at the receiver to split them apart. With the right type of fiber it is possible to have a device that does both simultaneously, and can function as an optical add-drop multiplexer. In Fiberstore,I find the WDM including CWDM and DWDM equipment.Now,we work together to learn what is CWDM multiplexer demultiplexer. CWDM multiplexer demultiplexer Module is a flexible, low-cost solution that enables the expansion of existing fiber capacity. Coupled with highly reliable passive optics certified for environmentally hardened applications, the CWDM Mux/Demux lets operators make full use of available fiber bandwidth in local loop and enterprise architectures. 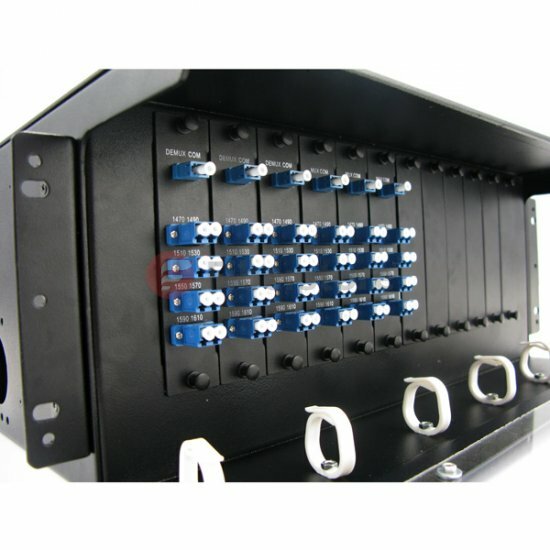 The CWDM multiplexer/demultiplexer is a universal device capable of combining nine optical signals into a fiber pair. It is designed to support a broad range of architectures, ranging from scalable point-to-point links to two fiber-protected rings. The CWDM Mux/Demux is designed to interoperate with both the Wave Ready line of transponder and optical regenerator solutions as well as CWDM transponders and small form-factor pluggables (SFPs) used in widely available transmission equipment. With billions of field operating hours, the industryleading optical multiplexing technology offers unparalleled reliability and leading-edge performance. America’s CWDM module supports eight CWDM channel, in the near future is expected to be extended to 16 within the full spectrum wavelength. And launch of the CWDM system is said to have a comprehensive network management function, can to equipment remote monitoring, configuration, and the alarm. In addition, the CWDM has made the card into the recent popular GPON (gigabit PON) system. Recently, the American time warner has signed a long-term purchase agreement, includes: WavSystem of CWDM module will be used in New York, Ohio, the deployment of gigabit metropolitan area network. In terms of optical fiber, the current us lang – development of full wave fiber and corning SMF28 – e fiber (g. 652 c) basically eliminated the water peak attenuation and macro bending loss, and other properties with conventional single-mode g. 652 optical fiber; Japan introduced two kinds of suitable for CWDM fiber of low water content, the fiber maximum eliminate residual fiber of OH – ions, reduce the transmission loss. The use of these optical fiber, is expected to greatly promote the wide popularity of CWDM technology, especially in the application of long distance communication. In terms of optical fiber, the Japanese launched two suitable for CWDM fiber of low water content. The fiber in the utmost elimination of fiber OH ions residue, reduce the transmission loss. 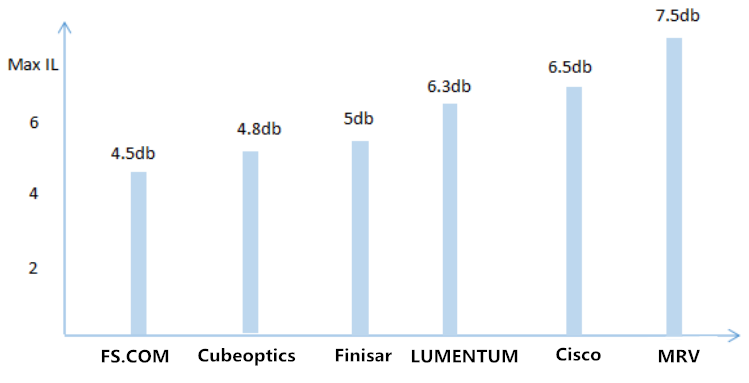 In addition, corning, companies such as lucent also produce optical fiber low water content. The use of these optical fiber, is expected to greatly promote the wide popularity of CWDM technology.